Brioche rolls develop their rich dough with eggs and butter. An overnight rise allows time for the dough to develop. 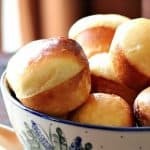 This recipe for brioche rolls comes from the magazine, Cooking Light, and these dinner rolls will deepen your confidence in baking bread at home. Brioche is a rich, yeast bread. It is different from other breads in that its dough gains flavor and depth from eggs and butter. How do you eat brioche? Brioche has a buttery taste that lends itself well to many occasions. Warm brioche fresh from the oven is a welcome treat. So too is toasted brioche with butter and jam. Try this plum jam or this recipe for orange marmalade to complement your homemade brioche. 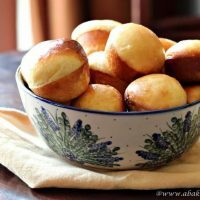 Homemade brioche dinner rolls are a special occasion bread. Making bread at home is rewarding and you’ll be happy serving these rolls with your Sunday meal, with Easter dinner alongside a ham, with Christmas dinner with a roast, with Thanksgiving dinner with turkey, or as a special addition to any weekend brunch. Brioche is also the type of bread that holds up well in baked recipes. Use cubed brioche in a bread pudding recipe or make a beautiful French toast. 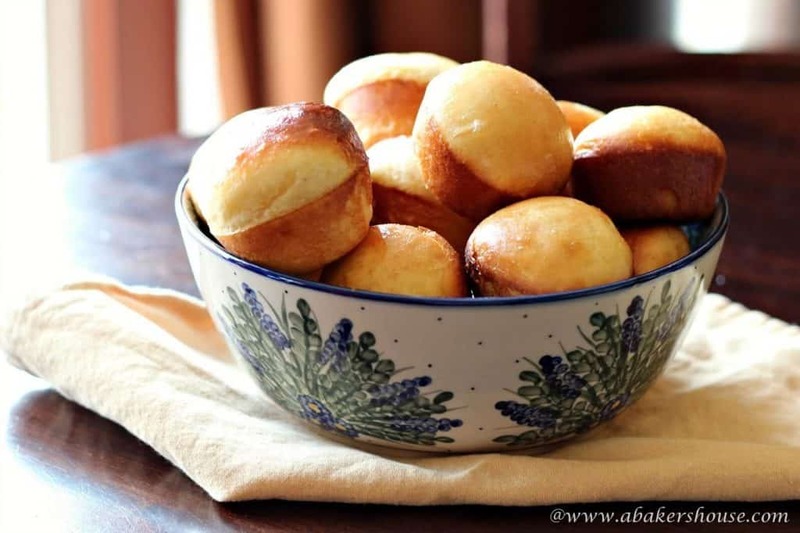 What a treat to find this recipe for brioche rolls from the magazine Cooking Light. Making brioche rolls is a time-consuming recipe since an overnight stage in the refrigerator is required but don’t let that hold you back. This was my first time making a bread dough with eggs and the dough was beautiful. The eggs add a richness to the dough– the color of the dough looked like no other I’ve made before. The color, texture, and shine of the dough all contributed to the success of this bread. Brioche dough is easy to work with and the recipe is an excellent choice for bread baking beginners and experts alike. Baking the rolls in muffin tins was a good way to make these rolls. Brioche may be baked as a loaf in a bread baking pan or you may form individual rolls. Using a muffin tin provides structure and support for these rolls as they rise and then bake. To form the rolls simply take a piece of dough, tuck the sides under and form a ball shape by using your hands. Place the seam side down in the lightly greased muffin tin. Brioche rolls develop their rich dough with eggs and butter. An overnight rise allows time for the dough to develop. 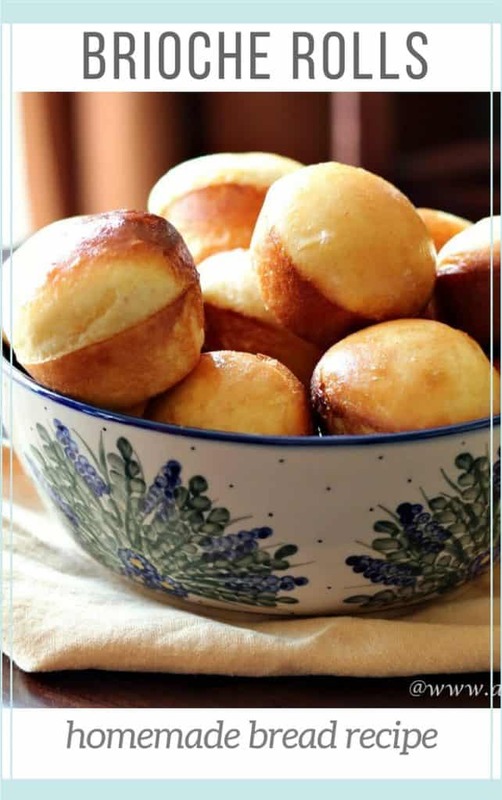 This recipe for brioche rolls comes from the magazine, Cooking Light, and making it will deepen your confidence in baking bread at home. Warm the milk and dissolve the yeast by whisking it in then let it sit for 5 minutes in your stand mixer. Add the flour, sugar, salt and slightly beated eggs to the stand mixer bowl. Start with the paddle attachment. Mix on low until well combined. Now switch to the bread hook attachment. Beat on low for 5 minutes until a springy dough is formed. Add the butter in small pieces and beat until combined into the dough. Beat for another 5 minutes longer. Spray a large glass bowl with baking spray and place the dough into the bowl, turn it over a few times to coat the entire ball of dough. Spray baking spray on a piece of plastic wrap and cover the bowl. Let the bowl rise in a warm place for an hour or until it doubles in size. Punch dough down in the middle a few times, folding the dough on to itself each time; form into a ball. Return dough to bowl; cover with the sprayed plastic wrap again, and refrigerate 8 hours or overnight. Uncover dough; let stand 90 minutes or until dough is at room temperature. Divide dough into 4 equal portions and cut each into 6 pieces. Form each piece into a ball. Repeat procedure with remaining dough to make 24 rolls total. Place rolls in muffin cups coated with cooking spray. Cover with a large piece of plastic coated with baking spray and let rise for 45 minutes or until almost doubled in size. Make an egg wash by whisking the egg white and water. Brush the rolls with the egg wash.
Bake at 350° for 14 minutes or until the tops of the rolls golden. Place pans on wire racks. Melt the remaining butter. Brush butter onto rolls. Pin this homemade bread recipe with me! I haven’t ever tried baking brioche, but now that you’ve posted this I’m going to have to give it a try. I think I’ll definitely have to try these for Easter. This was a great recipe from Cooking Light. It makes a bundle though–24 rolls!– so these will be ready for a crowd at Easter and will disappear quickly! Thanks, Sarah! This is a great recipe to try at home. I love Cooking Light magazine recipes and have a drawer filled with them. Thanks, Paula, I will keep trying and know I can improve these rolls. Have you made it before for your blog– I’ll be sure to read and learn from you! Wonderful rolls…they look great to me. A breakfast, lunch or dinner roll — very versatile! Thanks, Dorothy, I enjoyed these brioche rolls. And yes, I ate them for breakfast, then lunch then dinner too! I have a few left and am debating using them in a brioche bread pudding so that knocks out dessert too! I had some of your Brioche rolls for breakfast and loved them Holly; now thinking I have to make the bread for my next round of short rib sandwiches. Thanks for sharing the rolls and the recipe! Hi Barb, even when you find a new place and move a bit farther away I am going to still drop food off on your doorstep! I always appreciate that you share your goodies with me, thanks! Holly, these Brioche rolls look amazing! Nice color and taste & texture must be good 🙂 Thanks for sharing and happy baking!!! Thanks so much for your kind comment, this was a great Cooking Light recipe for brioche rolls. Happy Baking to you as well! I love brioche too, and these look absolutely FABULOUS!!!!!! These little rolls look amazing! I should give them a try soon. I just made my honey butter dinner rolls again yesterday but I’m always up for trying new bread recipes. Pinning for future reference. Oh Holly…these rolls are beautiful and your photography of them is so lovely! Brioche is on my to do list this year. I have a feeling mine won’t turn out as pretty! Hi Anne, thanks so much for your kind words. I am sure your brioche will turn out even better than mine! Let me know when you try this recipe, happy baking! I love Brioche rolls!!! I’ve never tried baking this bread yet but now I am determined to! 🙂 that rib sandwich with Vermont cheddar cheese on brioche bread sounds simply amazing!!! yum! beautiful rolls! Thanks, Alice, and yes, the rib sandwich was fantastic. I think I’ll try other egg-based breads soon. I always enjoy what you bake and look forward to your next post! These look so fluffy and beautifully browned. My mother loves brioche. Maybe I will surprise her with some. Thanks. Thanks, Wendy, what a nice idea to share this with your mother! I wish my mom lived closer and I would drop these by her house too. Thanks for stopping by! Thanks, Lora, it is wonderful to bake again with you this month. I just love brioche bread. I’ve never made it at home though. The rolls look wonderful. So fluffy, Holly! I think they are gorgeous – even though some are more brown on top than others. I’d love these with some raspberry jam! Thanks, Sally! I think next time it would help it I were more consistent when brushing on the egg wash– the rolls might have had better luck browning consistently. Still I ate so many of them that they couldn’t have been all that bad, right? Thanks for stopping by. I think the rolls turned out beautifully. I’m wanting to reach in and grab one from the screen. I can only imagine how fabulous they must be hot with butter. Yum! Thanks, Renee! Aren’t rolls so tasty right out of the oven? It makes you not want to buy any from the grocery store again!